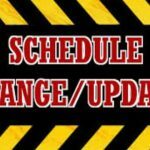 WWJH Track Meet has been rescheduled and will take place today 3/6/18 at 4:00 pm at TMHS. Due to impending inclement weather, the Willow Wood Junior High Track Meet scheduled for 3/5/2018 at TMHS has been cancelled to mitigate participant and fan safety concerns. We appreciate your patience and understanding.